Make sure you get your yoga practice in, even when you are stretched for time. This Express Yoga course is a curated set of short classes covering a range of key areas and focal points. Perfect for your lunch break, or or any other small window you might find in your day. Regular short sessions can be more beneficial than longer sequences that can’t be practiced regularly. Make a difference to your sense of wellbeing with just half an hour of yoga each day. Class 2 – Forward bending basics and fundamentals are the focus of this class. Each pose is presented in a way that will suit students who are working with stiffer bodies. However the video is also suitable for more experienced students who can take the forward bending further. 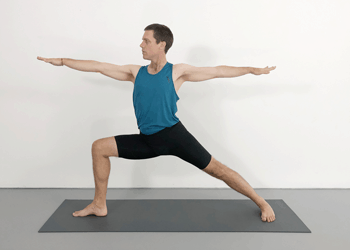 Class 3 – This class includes a range of restorative chest opening poses. It is an ideal boost during times of low energy. The sequence can easily fit into a busy schedule and helps you to prioritise health and wellbeing during stressful times. Class 4 – Give yourself a burst of energy with this half hour backbend sequence. Great for strengthening your legs, opening your chest and boosting your energy levels. These classes encompass the full range of key Iyengar yoga poses, divided into standing poses, forward bends, backbends and restorative, each 30 minutes in duration. Regular practice covering these areas will ensure that you have a balanced practice that expands in many directions. Be supported in building a rewarding home practice, even when you are time poor.